I heard about the passing of Gene Colan late last night. It's really sad to think that another of the masters of comic art is no longer with us. All my best to his friends and family. One of the first Batman comics I ever read as a kid was by Gene. 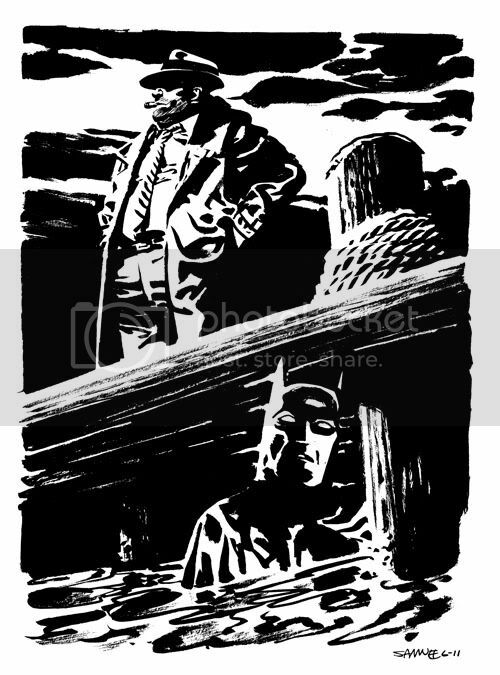 Memory may be failing me now since that was so long ago, but I seem to remember Detective Harvey Bullock out at the docks in Gotham... and Batman being under water at some point. Although those two things may have been unrelated in the book I went ahead and mashed 'em up for today's tribute to Gene "the Dean". Batman wasn't the only book that Gene drew, although it was the first thing I saw and went "Wow, what is THIS?!!!". Gene's amazing art graced the pages of Captain America, Daredevil, Night Force, Howard the Duck and scores of other outstanding work that has been a real inspiration to me over the years. Thanks for everything, Gene. We miss you already. Also, a group of artists all took our hand at inking a Dracula sketch that Gene had pencilled a while back. The inked pieces are each being auctioned on Ebay HERE. With new pieces popping up each week and all proceeds being given to the Hero Initiative. My piece should go up shortly, if you want to keep an eye out. Big thanks to Ande Parks , whose piece is currently up for auction, for organizing the whole thing.